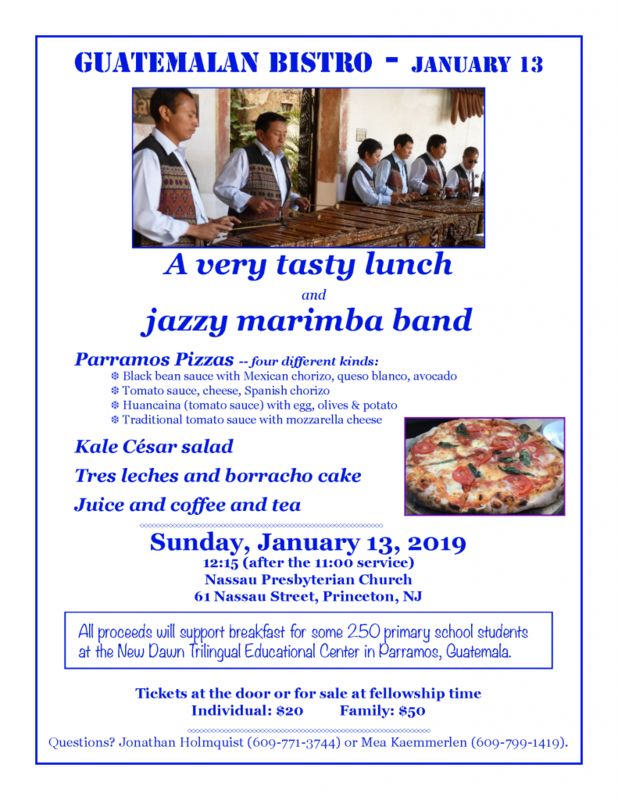 Again this January, we will hold our “Guatemalan Bistro” featuring a lively Guatemalan marimba band, gourmet Latin pizzas, pastries, and coffee and a report on the Princeton/Parramos Partnership. Join us on Sunday, January 13, at 12:15 in the Assembly Room. This is the last year of our support for the New Dawn Trilingual Education Center in Parramos, Guatemala. The Bistro will support the breakfast program for the entire primary school. Tickets are $20/person and $50/family and will be sold at the Assembly Room door. For information contact Mea Kaemmerlen (meakaem@aol.com) or Jonathan Holmquist (jholmqui@temple.edu).